Stickers! Shipping Labels, Bumper Stickers and More!! Stickers and labels are our specialty. We can print your artwork or text on all types of material, sizes and shapes. Ask about our white gloss, matte litho, clear poly, fluorescents, dull silver and gold, polyesters or even tamper evident stock ("VOID") Permanent and removable adhesives available for standard applications and for extra stickiness, we have a tire adhesive. Your stickers can be printed using 1 to 6 spot colors or beautiful 4-color process. Blind embossing and foil stamping are also available. Another feature we have is sequential numbering. Small and large quantities are no problem. We print our stickers on the premises to assure quality. Request one to three ink colors or full color process on a custom shape or use our in-house standard shapes. Squares, Circles, Ovals, Rectangles, starbursts! 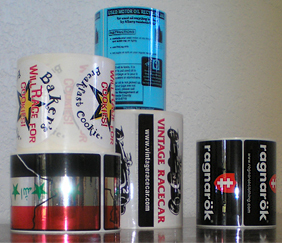 All labels come on rolls for easier peel off or special request for individual sheets can be made. Check out our price breakdown when requesting a quote for stickers. The higher the quantity, the lower the cost per sticker. We also offer vinyl cut-out lettering for the back of car windows, store fronts or anywhere you can think of. Most of our labels are laminated to protect from weather and scuffing. Just tell us what you want and we'll print it onto stickers! Stock is the name given to the material of that is used to make the sticker. The most common stock is paper. Litho is another stock much like paper. It is a non-gloss stock and is very easy to write or print on it. Latex is litho stock with a material called latex added to it to make it more pliant and able to be used on curved surfaces. Plastic is another material used as stock. It is flexible, but also extremely durable. Bumper stickers are an example of plastic stock stickers. The disadvantage of plastic stock is that special printing methods must be used on it. Finally, foil is a shiny and flexible stock that is very popular for stickers. --- Manufacturers of Custom Stickers for all occasions! Squares, circles, ovals, rectangles, starbursts, phone, sheriff badge, heart shaped! © 2003 Stickers Exchange. All rights reserved.